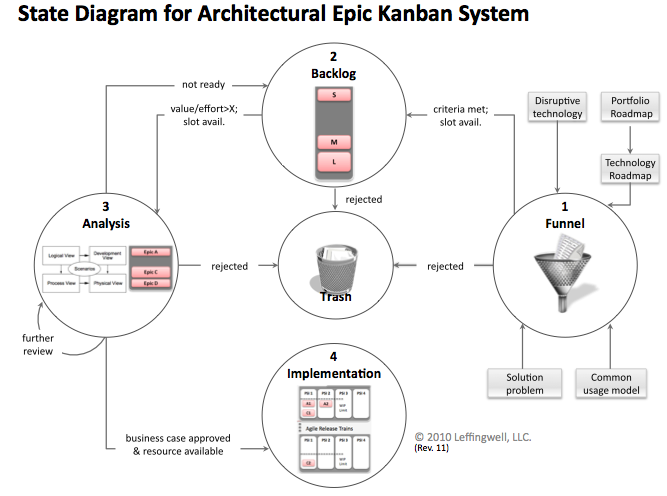 In the last few posts, we’ve been describing an architectural epic kanban system which addresses the objectives we described in this post. Last week, I met with system architects (and agilists) Santeri Kangas, James Cooper, Kuan Eeik Tan and Gabor Gunyho of F-secure Corporation to discuss the model further. We decided that while we liked the big kanban system graphic, it left many ambiguities as to how an epic transitions from state to state, including (for example) how one can be deleted. To this end, we put together a state machine model to further elaborate the activities and decision properties of the system. It appears in the graphic below. By the way, for an interesting perspective on architecture in agile in general, you might want to check out this Architecture in an Agile World presentation by James Cooper. The state transition diagram definitely adds clarity to the overall intent of what you guys are putting together. In principle, I agree with everything outline but I do so being relatively experienced in agile and knowing what to watch out for to avoid a non agile execution strategy for an agile concept. Knowing Dean well, I know what you guys are outlining is well intended to remain truly agile. That said, if I didn’t know Dean well, I would be a bit unclear on how above can remain agile in spirit. I like this. I think there is an important analysis and feedback loop missing. 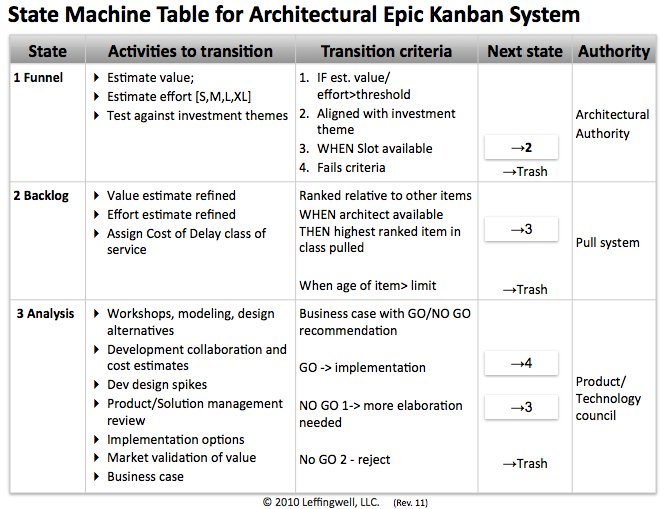 I believe an Epic may move through the Kanban more than once over time. Not all features in an Epic will be of equal value at a point in time. You might pass an Epic through and perform that small subset of the Epic that is needed to fulfill the value goal. Then the Epic could end up back on the backlog for version 2. You could show this refining process and the return queue on your State Maching Table. 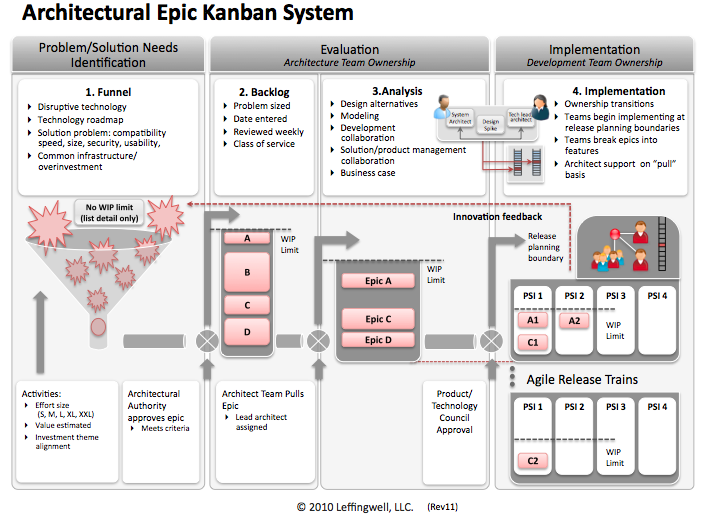 I think this is important to explicitly call out since our understanding of the Epic is refined as we move it along the Kanban.